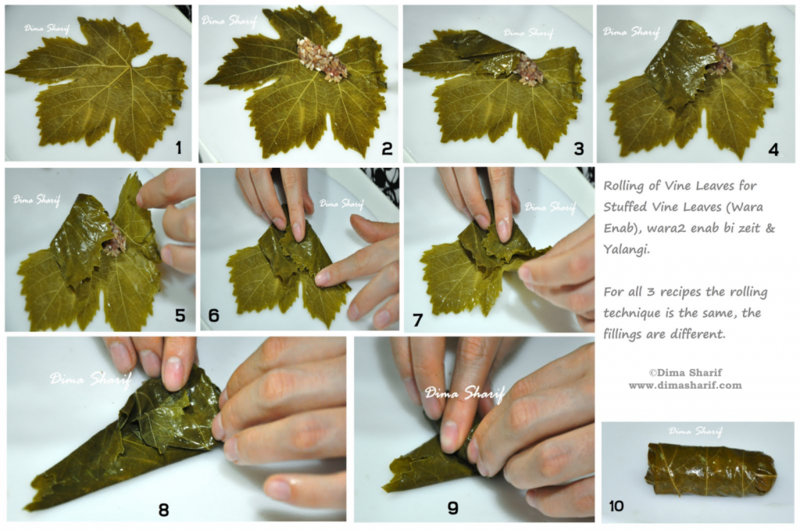 Filling and rolling the vine leaves is a basic technique, extensively used in Arabic and Middle Eastern cooking. The stuffed and rolled vine leaves are truly delightful, a very unique and delicious flavour and therefore it is really worth learning. Remember as ever no one was born as a professional roller! We all had to start somewhere and we all had to learn. And if we all could, so can you. I promise it is worth the effort! Here is how it’s done in pictures and below I described the steps for you. I am doing my part as you can see, all you need to do is try! place about 1/2 tsp of filling in the centre, squeezing the filling together, so it is not spread out on the leaf. Fold the top part downwards, to cover the side and the filling. Fold over the furthest side to tuck in the folded part in step 3 and enclose the filling in the centre. Be gentle as to not tear the leaf, yet, fold tightly, so they don’t roll open when cooked. Repeat step 3 for the opposite side. Folding the top part downwards. Repeat step 4 for the opposite side, Tucking the side over folded top. Now you should have all sides folded over and enclosing the filling completely. Gather up the centre, tucking in any parts of the leaf that are too big and showing off the sides. Fold in the bottom sides towards the centre to make the bottom a little narrower than the top part. Start tightly but gently rolling the top downwards, and roll till the end. Now you have a rolled vine leaf 🙂 Repeat, till all quantity is finished. Below is a video on how to make the Greek Dolmates Yalanzi. I thought to include it here because besides giving you a delicious grape leaves recipe, it does show you how the leaves are rolled. 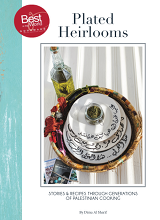 Just mind you, in Arabic cuisine and especially when it comes to making the main course vine leaves, the rolls are made small and thin not large and thick as done in other Middle Eastern and Mediterranean cuisines. The trick is really to reduce the filling and also to tightly roll the leaves. Also worth mentioning here that leaves that are very large are usually halved before rolling in order to keep the size small and uniform. I hope that rolling vine leaves became a bit easier. Do try it out and remember, PRACTICE MAKES PERFECT! Napoleon Bonaparte “The Father Of Canned Food”!